Abstract: Citizen science is gaining recognition as a means for public collection of valuable information which can improve reef management outcomes. Benefits include increased data to supplement scientific research programs; community engagement and capacity building; and cost-effective and innovative program structures. Yet, citizen science programs often face significant challenges to deliver sustainable and best-practice programs. Some of the common difficulties include insufficient funding, limited staff capacity, insufficient awareness of the program by data users, and/or perceptions of the low credibility of citizen science data. In 2012, a scoping study consulted a range of stakeholders to identify critical needs and opportunities for a more coordinated approach to citizen science across the Great Barrier Reef (GBR). 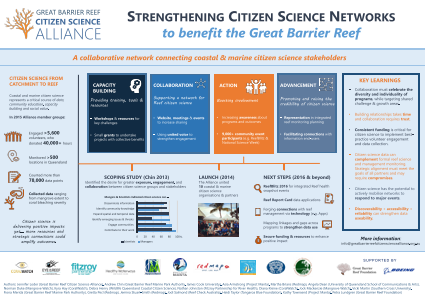 The Great Barrier Reef Citizen Science Alliance (Alliance) network evolved as a response to this study. The Alliance mission is to foster collaboration, capacity building, advancement and action for citizen science that benefits the Great Barrier Reef. The program is hosted by the Great Barrier Reef Foundation, with support from corporate partner Boeing. Ten member groups from coastal and marine citizen science programs are actively engaged in this initiative. This poster will share the past successes, strategies and future plans of the Alliance. It will showcase the benefits of a strategic and collaborative approach to strengthen opportunities for citizen science providers, researchers, Reef managers and the Australian community to tackle key Reef issues.